BEHAVIOR was neglected for many years because it was ephemeral, not fixed like bones or beaks, feathers or fossils and museum specimens, in ways that allowed systematic study by many observers. It was the great insight of ETHOLOGY that observations of behavior have great power to inform ideas about how organisms change. Ethologists (looking for diversity and adaptive change) and comparative psychologists (looking for fixed rules of behavior independent of environments) appeared to compete. Among the most powerful demonstrations of the workings of evolution is Ritualization: the “improvement” of a behavioral pattern that evolved to meet a specific biological need coming to be relevant to meeting another, often very different need. 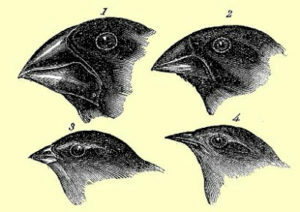 For example, the selection pressure of sexual selection (natural selection serving traits important in courtship and reproduction) may select for a trait may is an effective or efficient means of communicating–especially the sexual development or motivational state of the actor. A common example is the change in a motor pattern reflecting a homeostatic adjustment to ambient temperature (e.g. feather fluffing to retain heat in a cold atmosphere). Such behavior is generally the function of the autonomic nervous system. Such a signal may also function to communicate that the actor is under mild stress. If it is adaptive to communicate the underlying stress response, exaggeration of some specific aspect (size or shape of feathers) would improve that function. (read more) When a behavioral pattern is no longer under the control of stimuli which originally evoked it, it is said to be “emancipated.” Amongst the most fascinating examples are signals that began as reflexes of the autonomic nervous system that eventually come under the control of a social stimulus. That is, a shared causation for adapting to challenges to meeting physiological needs and those to meet social needs (aggression, courtship, reproduction) is often the autonomic nervous system. (read on). Exaptation: “Stephen Jay Gould‘s proposed replacement for what he considered the teleologically-loaded term “pre-adaptation” and the related term co-option describe a shift in the function of a trait during evolution. For example, a trait can evolve because it served one function, but subsequently it may come to serve another. Oliver Wendell Holmes Sr. The Poet at the Breakfast Table (1872). COMPETITION and COOPERATION. “Evolution is based on a fierce competition between individuals and should therefore reward only selfish behavior. Every gene, every cell, and every organism should be designed to promote its own evolutionary success at the expense of its competitors. Yet we observe cooperation on many levels of biological organization. Genes cooperate in genomes. Chromosomes cooperate in eukaryotic cells. Cells cooperate in multicellular organisms. There are many examples of cooperation among animals. Humans are the champions of cooperation: From hunter-gatherer societies to nation-states, cooperation is the decisive organizing principle of human society. No other life form on Earth is engaged in the same complex games of cooperation and defection. The question of how natural selection can lead to cooperative behavior has fascinated evolutionary biologists for several decades.